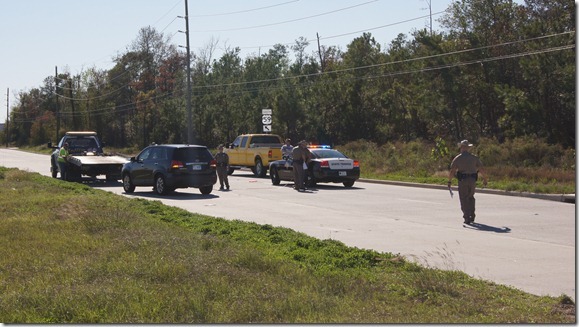 EAST MONTGOMERY COUNTY — Early Monday afternoon, a Houston man lost his life in a bizarre auto vs. pedestrian collision. 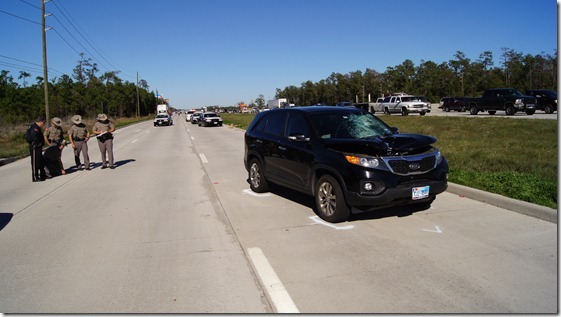 Rebecca Doleman was driving her KIA SUV southbound on the feeder of US 59 just north of FM 1314 in Porter. In the backseat were her two children, ages 5 and 18 months. 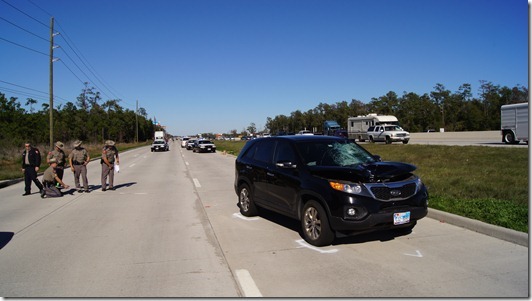 As she approached FM 1314, Doleman saw a vehicle in the right lane with its flashers on. She slowed and started moving to the left. 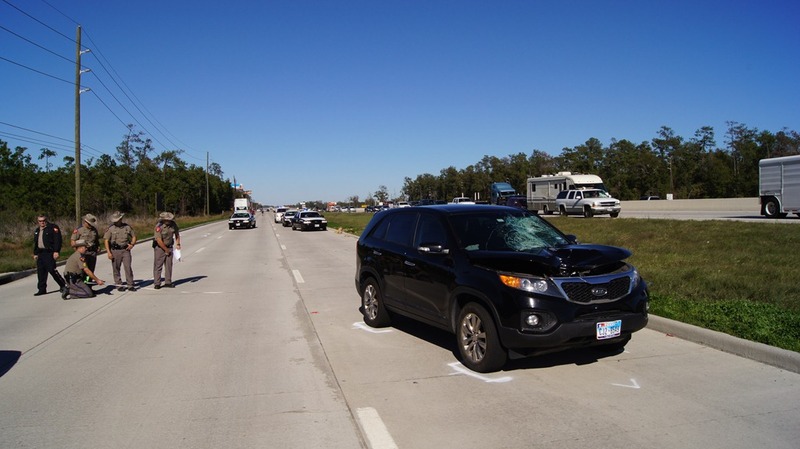 According to police, at that point, 50-year-old Roy Sharp of Houston darted out across the lanes in front of Doleman’s vehicle. She applied the brakes using both feet, but he continued to run across even as Doleman tried to steer away from him. Unable to stop, she struck Sharp, who was thrown up onto her windshield. The Texas Department of Public Safety closed the feeder as Montgomery County Hospital District medics arrived on the scene. PHI Air Medical was dispatched, but as the helicopter landed near the scene, Sharp went into cardiac arrest. 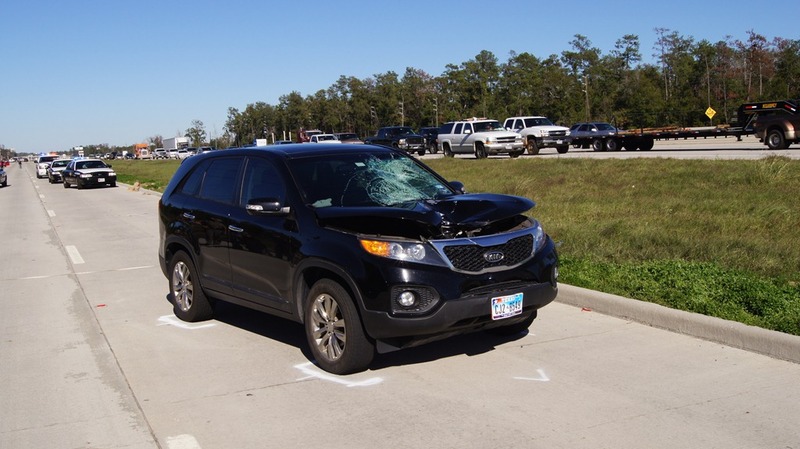 A decision was then made to transport the victim by ground ambulance to Kingwood Hospital in an attempt to stabilize him. 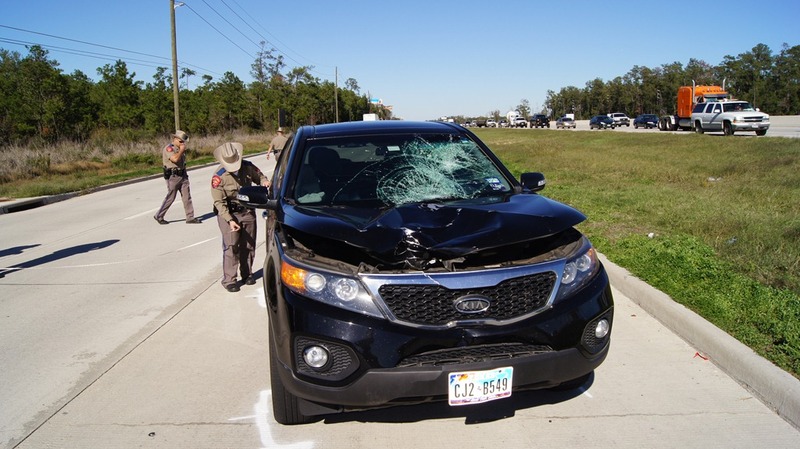 The PHI crew accompanied MCHD medics as the helicopter lifted and flew to Kingwood Hospital. Doctors at the hospital in Kingwood were unable to save Sharp. He was pronounced dead at 3:57 p.m. 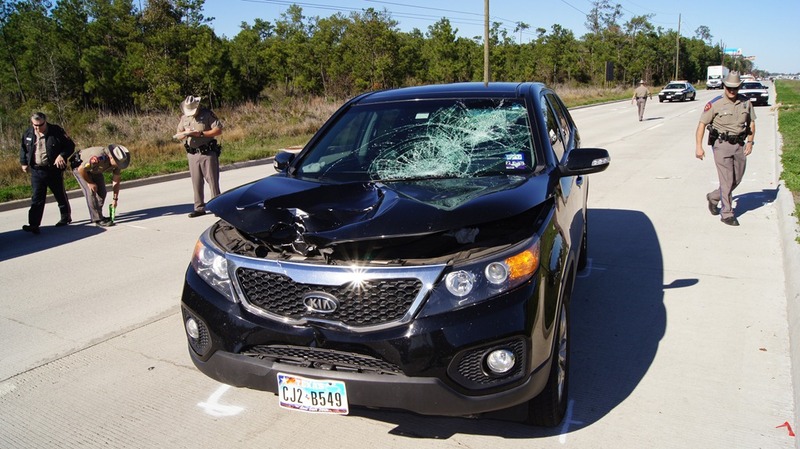 According to one witness, Sharp and two females were parked in the moving lane of traffic on the right side of the feeder road with their vehicle’s flashers on. They were reportedly taking photographs of the location because of an accident that occurred several days ago. 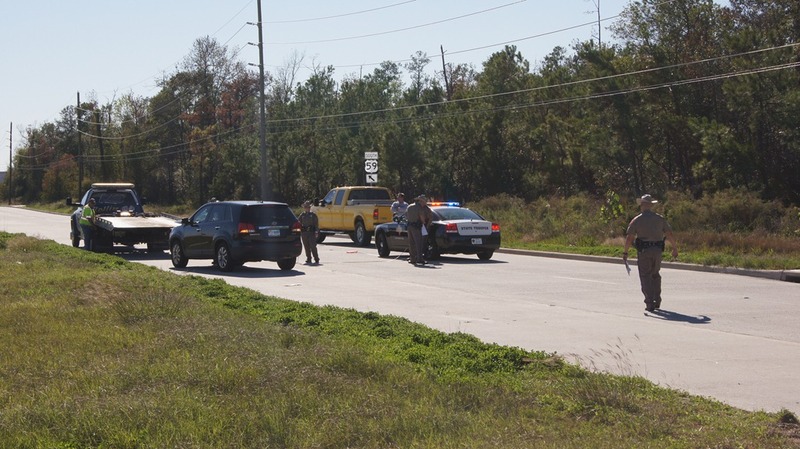 The DPS investigation is continuing, but no charges were filed. Roy Sharp had his wife and granddaughter in the car. His daughter was the one across the street, and he was watching out for traffic for his daughter (he was not even going to cross the road)Roy also had a medical condition and he is unable to run. So for that B**** to say that he was running or (darted)…well you know who is LYING. Also the family was not there taking pictures, they we looking for evidence. Roy was waving the stupid girl to move over and she didn’t. So for him protecting his family that was in the car (because she was coming straight forward) he lost his life. The Wife seen the whole thing, she sits at home, closes her eyes and pictures her husband flying across the road. 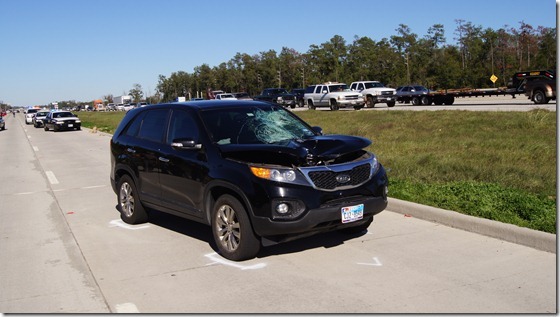 Roy flew at least 60 feet from where his car was (where he was standing!!! ), do you really think she put both feet to the breaks. I hope she dreams at night and it hunts her for the rest of her life, for she committed a wrongful death. Seems like the cops needed to do a better investigation… Where is the Justice in this???? Thanks to everyone for opening there eyes, to look at the pictures and not sticking to one story. Roy Sharp deserves Justice. Not true. Do some research… she wasn’t paying attention to hit someone that hard. I drive a camaro and it has anti lock brakes, it does leave marks. There is always two sides to a story. There are witnesses on behalf of Roy sharp. Where is that report? if this woman who killed the innoccent person on the highway applied the breaks with both feet then why arent there any black marks on the road?? ?